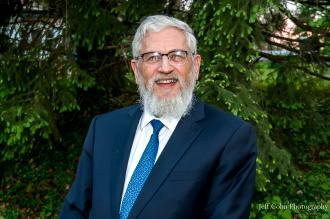 Baltimore Jewish Life | Parshas Terumah - Build the Wall! Parshas Terumah - Build the Wall! Among the vessels enumerated in our portion is the Mizbeach, the Altar. נבוב לחת תעשה אותו (שמות כז ח), Hollow, of boards, shall you make it. The construction of the altar began with the creation of a five-cubit square comprised of four boards of acacia wood leaving a hollow space between them. The walls were plated with copper, adding horns, rings for staves, a border, and a netting of copper meshwork. A glaring omission is the lack of guidance as to what was used to fill the empty space. Earlier, at the end of the portion of Yisro, after the giving of the Torah a reference is made to the need to build a Mizbeach Adamah, an Altar of Earth. We are taught that this is one in the same as the Altar described here, and indeed the hollow space was filled with earth. If so, why didn’t the Torah give more details in the original mentioning of the Altar and only referred to the earth that filled it? The Seforno asserts that initially before the Sin of the Golden Calf there would be no need for a Mishkan or Mikdash. Man, of any tribe, in his constant devotion to the Almighty could take up any space and infuse in service to G-d. Only after we failed to maintain that level of cognizance that a plan was implemented by which a single central location would serve as a focal point for us all, with the need of a special cadre of priests and levites who would be worthy to serve, with the rest of us finding our unique role, in the greater mosaic of service to G-d, in other realms. Another piece of the puzzle that is missing here is the absence of any reference to a roof on the altar. Was the top of the altar simply comprised of the topsoil of the earth that filled its space or was there a cover over the altar? The Chizkuni avers that it was only after the episode of the failure of the two hundred and fifty followers of Korach who all perished after they offered copper fire-pans of incense in an attempt to usurp Aharon and determine which one of them would be appointed in his stead, when the Torah instructed to fashion from these sinner’s copper pans a covering for the altar as a reminder to future generations to refrain from seeking the priesthood, that the altar finally gained a roof. Historically the altar transformed from a plain earthen mound to a hollowed copper plated wood structure filled with earth, yet exposed on top, to finally a copper plated roofed entity. What are we to derive from this process of evolution? In distinction to all the other vessels where the Torah details their specific purpose: the Aron, to contain the Tablets from where G-d will communicate from; the Shulchan, to place the show-bread upon it; the Menorah, to kindle its lamps, the Mizbeach’s details, however, are described without delineating its purpose - to offer sacrifices upon it. The Altar is situated on the place where the earth that man was formed from was extracted. It was on that very spot that Adam, Kayin and Hevel brought offerings, where Avrohom bound Yitzchok, where Kings David and Shlomo built the altar. Man’s very essence rises up from the ground yearning to return to that very first moment of existence, in Gan Eden, as Adam before the sin. Were we to be worthy, we would serve without barriers, simply taking that earth and create a space of holiness. In the post-sin world, we must create space for G-d, constructing walls that separate us from the delusions surrounding us, permitting us to focus on our duties and the privilege associated with it. Only then can we succeed in filling it with ‘earth of creation’. But therein lay the danger. We often, either shoot too high aspiring beyond our abilities and personal mission or become despondent when we realize we can’t attain those unrealistic goals. Wasn’t that the folly of the followers of Korach who threw down the gauntlet, knowing very well that only one of their ilk would make it, with the others doomed. In their do or die moment they embodied this dichotomy. Man needs to know his limits and must place a roof on his aspirations. On the other hand, he needs a reasonable roof to not only cap his ambition but even more so to define his specific mission. The Talmud utilizes the word נבוב, hollow, to illustrate how the letters on the Luchos, the Two Tablets, were hollowed out through the stone tablets they were engraved in and read נבוב on one side, and בובן, in the reverse, on the other side. Rav Kook explains that this is instructive as to how we can carve out for ourselves a constructive path in serving G-d.
First one must ‘hollow out’ his ‘space’ from the material world that occupies it, only then can one בו - בן, ‘in’ that space be בונה, build himself up, with healthy בינה, understanding and perspective. The building of an altar is not about the sacrifices per se, as much as it is about our constructing a ‘walled-in’ venue, an environment, a space, for holiness, that ultimately will define who we truly are.